The good people at NSR-World arranged a 2-Stroke and Grey Import bash for the May Day long weekend. Friday would be a trackday at Llandow in South Wales, Saturday a Dyno Day down in Plymouth and Sunday a ride-out on some of the roads in Devon. 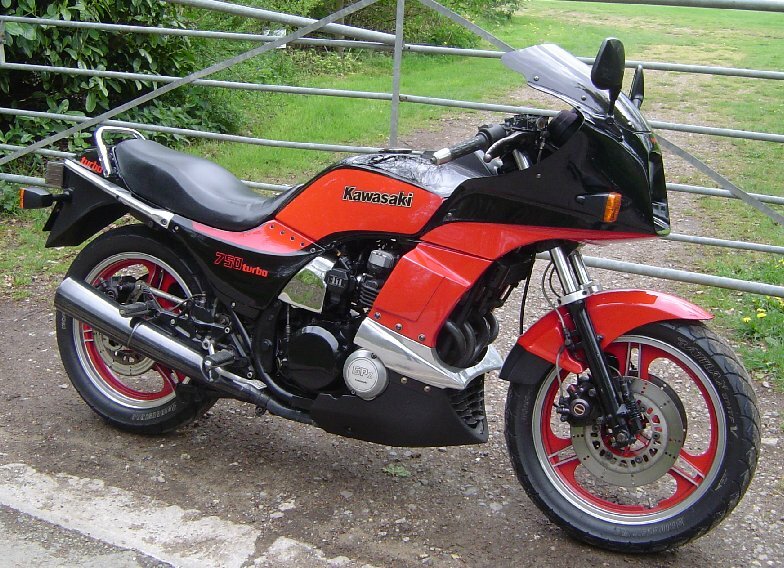 Several of the Diff'rent Strokers faithful signed up for the trackday and started prepping their bikes - Tom, Mick, Rob and Rich were all booked in early with either NSR's or TDR's which always seem to manage a good turnout there. Darin, Tim, Sara & Chell fancied popping along to spectate, so all met up at Darin's on the Thursday night. 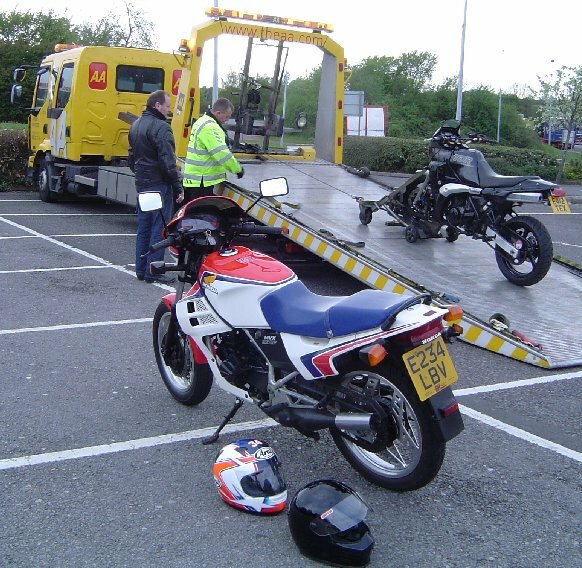 The plan was to ride his MC21-SP, NS400R and MVX there as the organisers wanted to see how many 2-stroke Honda's they could get in one place. 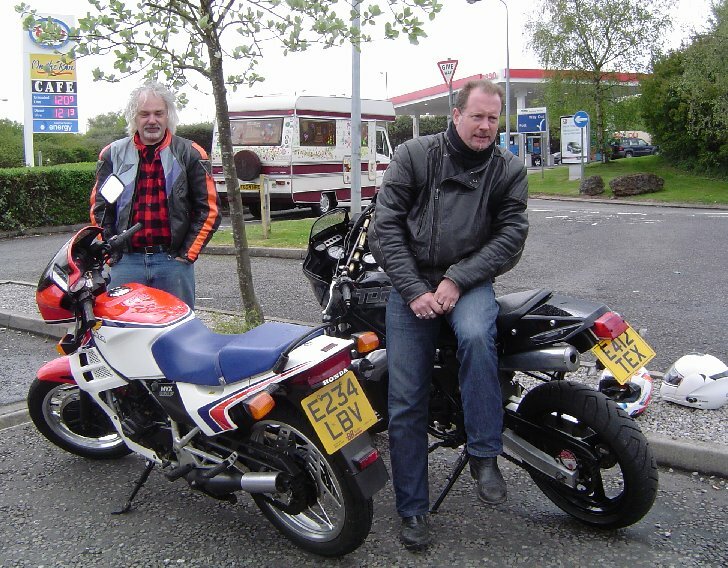 Unfortunately the 21 couldn't get an MOT with no rear indicators and the 400 doesn't like to get its feet wet, so they set off for Llandow mid-morning with the rainclouds looming - Tim & Sara on the MVX and Darin & Chell leading the way on his TDR. 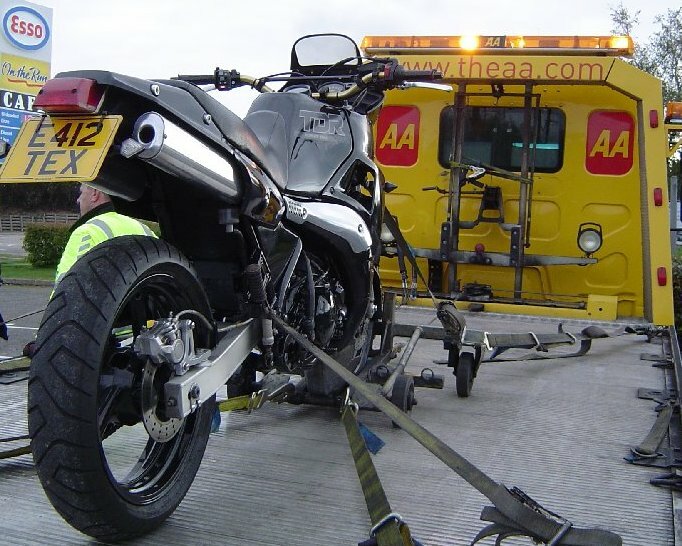 Less than ten miles in, Tim had to duck to avoid being decapitated by the TDR's flying numberplate. Some cable ties scrounged from a nearby tyre fitters solved that, and refreshed with unleaded and semi-synthetic they carried on. 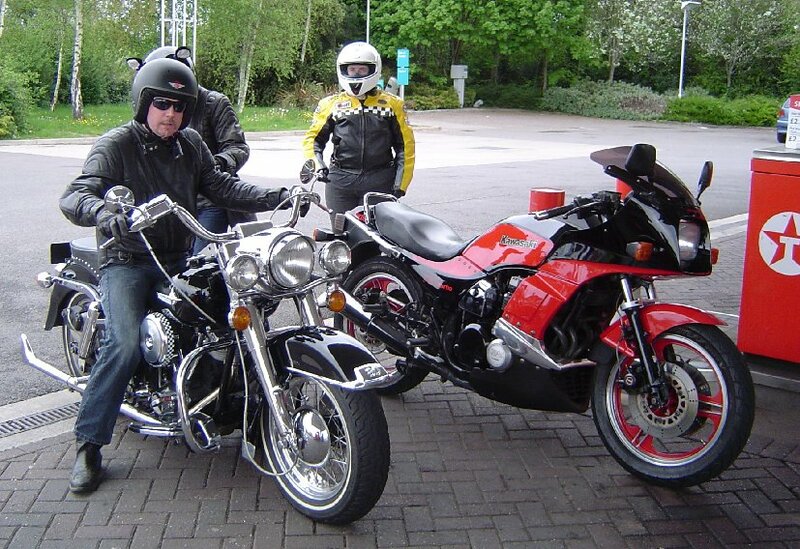 There was no avoiding the motorway so they braved the strong sidewinds over the spectacular M4 Severn bridge and discovered that bikes don't have to pay a toll. Bonus ! 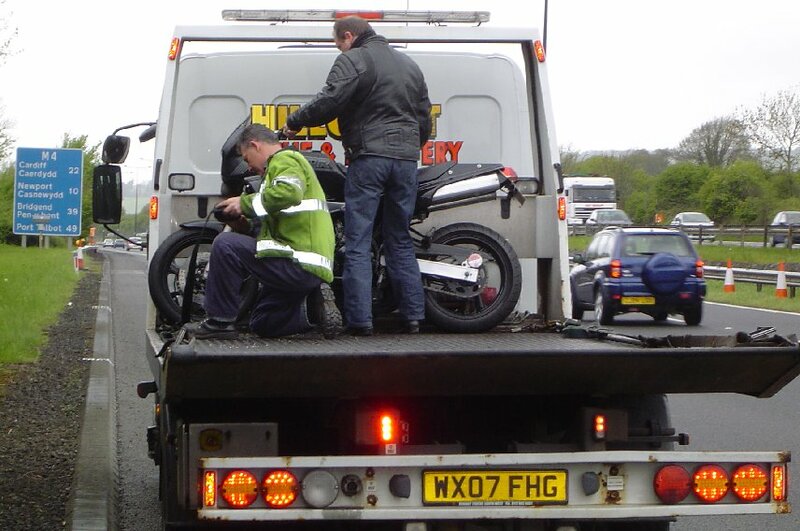 But a couple of miles later, Darin pulled on to the hard shoulder when the TDR started misfiring badly. Although it would run, sort of, it wouldn't take any throttle and there was no chance of riding it any further, especially two-up. They didn't have any tools but you can't work on a TDR anyway without stripping the whole thing. So the plan was to get the AA to take it the last 20 miles to Llandow where - luckily - all the UK's TDR experts happened to be, complete with tool boxes and spare spark plugs ! But the subcontract recovery driver (who turned up after an hour waiting in the rain) had strict instructions to take it back to Magor Services which they'd just passed. 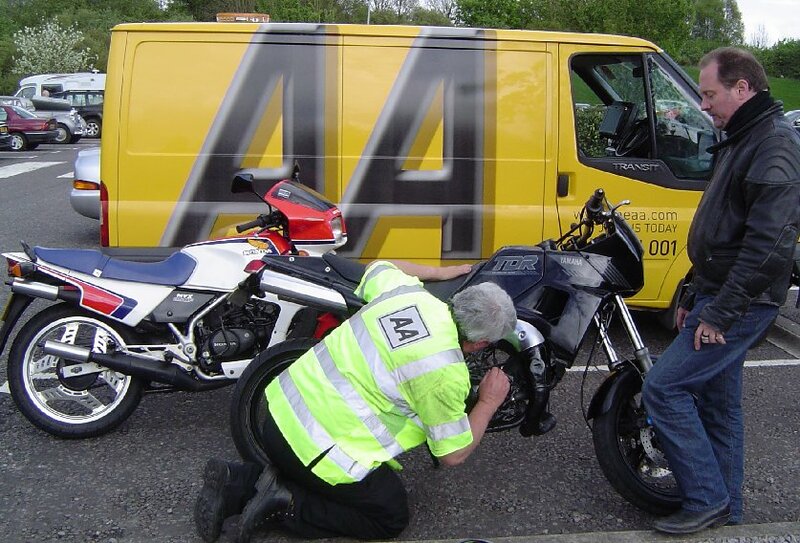 There, they had a further 2-hour wait for a proper AA man who quickly agreed that the TDR was unrideable, then a further 2-hour wait for a recovery truck to arrive, Tim to be mistaken for "that bloke on the telly" (?) and another hour to get the bike back home. At least Darin got to ride home on the Honda, which didn't miss a beat all day. You can see a clip of the misfiring TDR on YouTube. Bad coil connections were suspected, and indeed have since been traced and fixed. 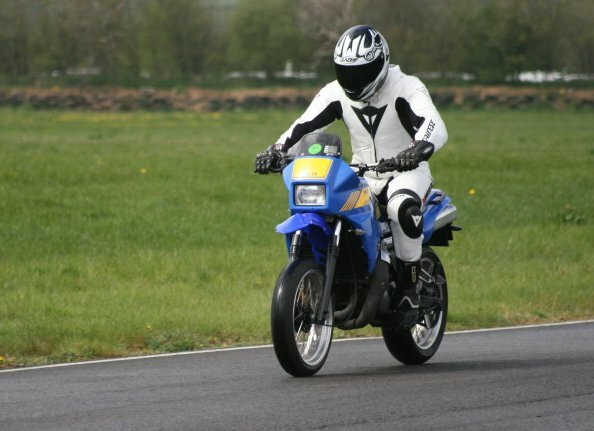 Being a recent new member to the NSR-World forum, my eye was taken by a 2 stroke and import trackday being arranged at Llandow, South Wales. 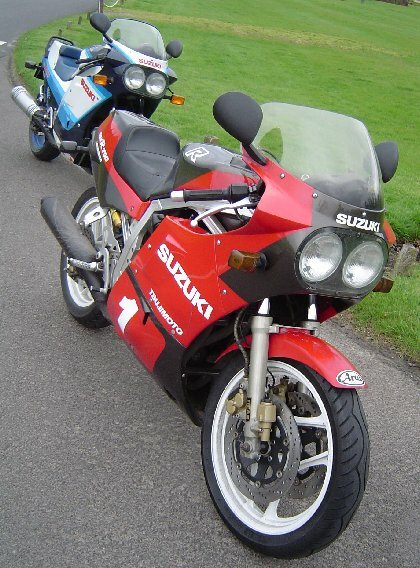 Seeing as I had only recently bought my first NSR and the track was only down the road from me, I jumped at the chance and put my name down immediately. 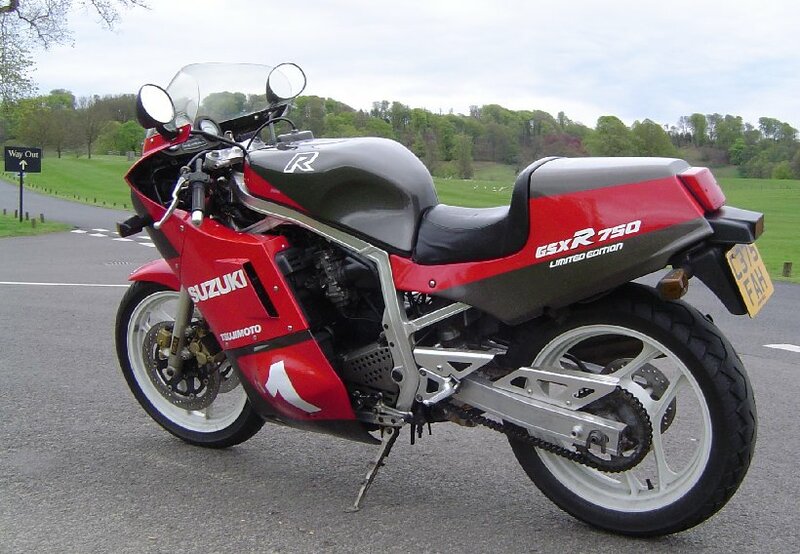 As time was counting down to the day, I bought another bike I had wanted for ages, a TDR250. 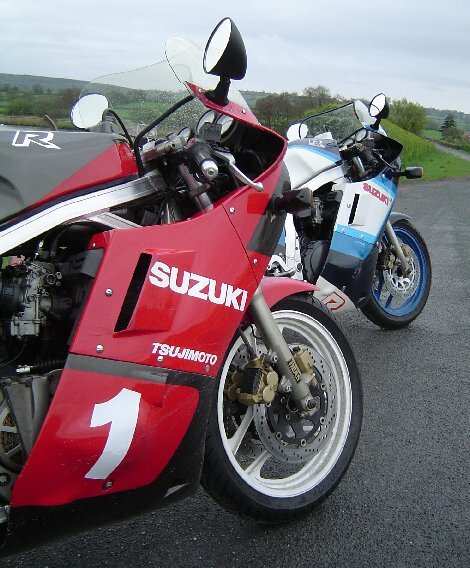 Knowing how these go, I knew there and then that both the NSR and TDR had to go to the trackday. Counting down the last few days, checking the weather for the weekend, I was getting despondant that it was forecast to rain all day until late afternoon, then would clear slowly. Oh well, maybe the last session or so would be drier. On the Friday, the van loaded with bikes, clothing, spare clothing (!) and nourishment, I left home at 7.00am with a surprisingly blue sky above, and arrived at a dry but subdued Llandow paddock. As soon as I switched the engine off, the sky darkened and it began to rain - typical ! Climbing out of the van, Mick and Tom from the TDR forum pulled alongside in their vans and after a brief morning greeting, all the TDR's were pulled out of their dry refuge into the rain. I decided that my lovely, shiny NSR didn't deserve to get wet, I would wait and see if the rain cleared before dragging it out. After all the formalities, meeting Andy from the NSR forum who had set up the day, filling out a form to sign on, and deciding to go into the novice group (first ever trackday, aware of my limitations ! ), safety briefing - at last, all systems were go ! I watched the fast group go out first, wondering how they would deal with the wet conditions. The rain had started to ease by now, and then it was the novice group's turn ! I took the first few laps very gingerly, checking out the grip level and which way the track went. No problems or mishaps occurred, and with my first session over, I was pleased to get back to the paddock safe and sound. As the day progressed, the weather improved slowly and at last, a dry line started to appear on the track. This gave me more confidence to push harder and things started to happen a lot quicker ! The rest of the day consisted of 15 minutes on/off track, drinking Mick's tea (cheers mate ! ), meeting a few new people, thinking of new and different excuses as to why I wasn't faster, and enjoying every minute. 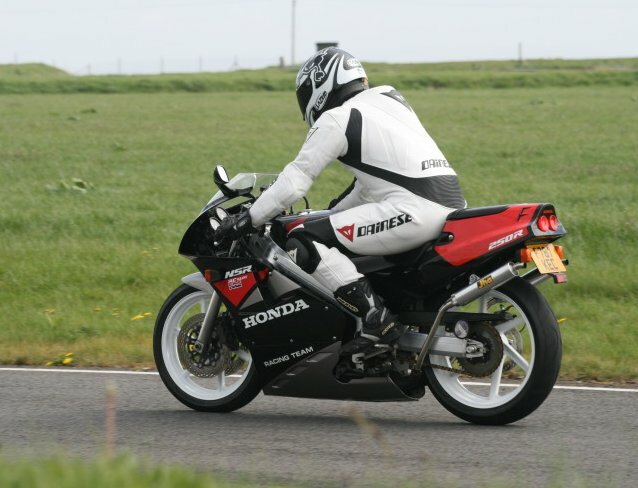 I did eventually take the NSR out on track too, but came back in before the session ended - I found the TDR much more fun and practical for a tight, short track like Llandow. So, on reflection, a trackday can be great fun, whatever the weather. It isn't all about going flat out, although it is fun trying to ! It's a much safer environment to stretch your and your bikes' legs than on the road, and a chance to learn new lessons of bike control and body positioning. Get out there and try it. Don't think that its not for you, everyone should find out how liberating it can be ! Nice one Rob, really wish we'd made it. So, what about the rest of the weekend ? We'd never intended to go to the other two NSR days. Instead, we were hoping to do something we'd talked about for ages, and get some of Darin's bikes out for a thras... erm, bit of a run. Rob was invited but the smell of his wife's cooking was too good to ignore. So on Saturday morning we dug a couple more iconic machines out of the secret underground bunker. 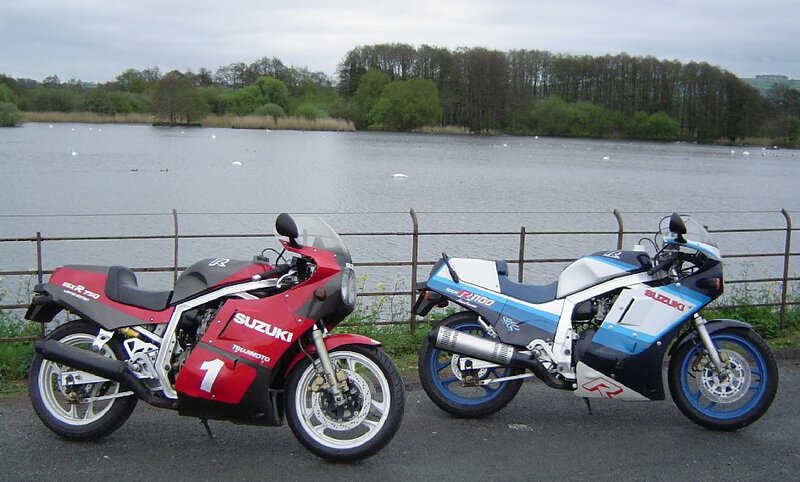 Not only were they a stark contrast to the day before, but also each other - a GPz750 Turbo and a Harley Electra-Glide. 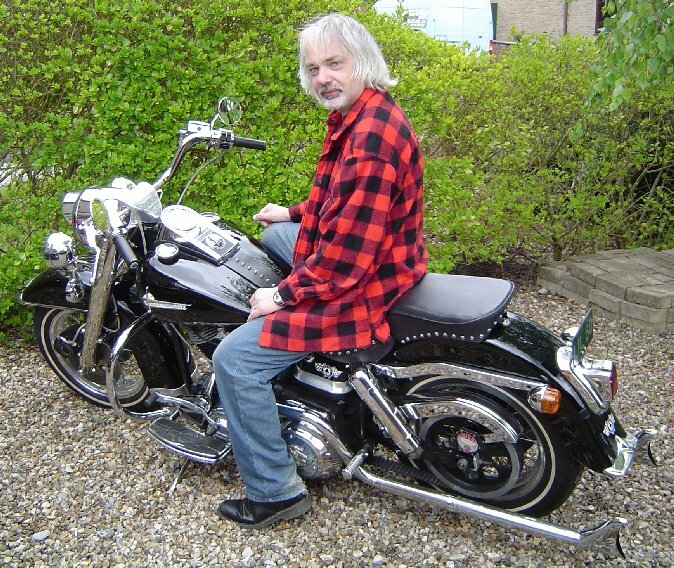 Tim weighed up his options for a couple of nanoseconds and plonked his arse firmly on the Kawasaki. The non-working boost gauge was a minor disappointment though. We all went out for a nice ride followed by a pub lunch. 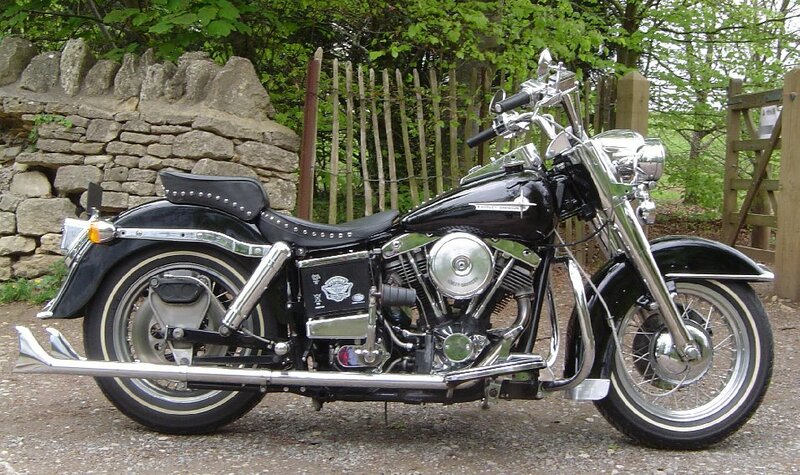 After that, and despite feeling way out of his depth, Tim took his turn riding the Harley. Or is it driving ? Sara jumped on the back and they took off, the unsilenced 'potato potato' (TM) booming off the houses causing passers-by to spin round in alarm. Tim described cornering as "a bit of leaning, a bit of steering and a lot of swearing, some of it from immediately behind me", and grabbed the Turbo back at the earliest opportunity. 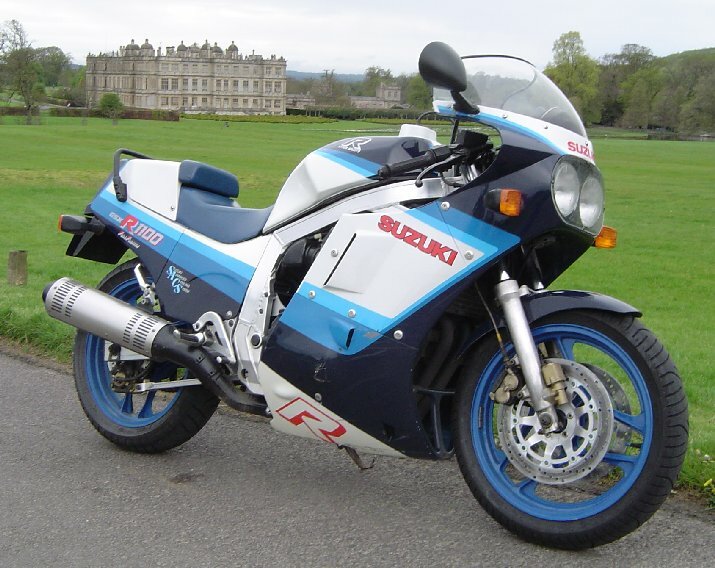 Back home and with the girls off shopping, we swapped the bikes for a pair of '86 GSX-R's. 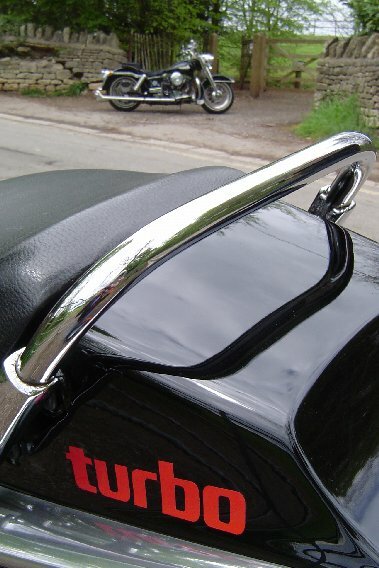 Tim took the 1100, and though it was a long time since he'd ridden a 'Slabbie', by the time he reached the end of the street he was mentally clearing a space in the garage for another one. We were out for about an hour in a mix of sun and rain, ending up at Longleat House for a couple of photos. Then we switched bikes, getting a great comparison between the grunty 1100 and the lighter, more exotic 750 Ltd, with its lovely induction roar coupled with the 'ching' of the dry clutch at every gear change. Home again, with the bikes wet and dirty, we looked at each other, turned round and immediately went back out again for another hour. The most enjoyable afternoon we've both had for a long time.